The federal High Court in Lagos has remanded in Ikoyi Prison, the lawmaker representing Delta North Senatorial District, Peter Nwaoboshi, following his arraignment for an alleged N322m fraud. Justice Mohammed Idris made the order after the Economic and Financial Crimes Commission (EFCC) opposed Nwaoboshi’s bail application. The judge adjourned till April 27 (Friday) to rule on whether or not to release the lawmaker on bail. 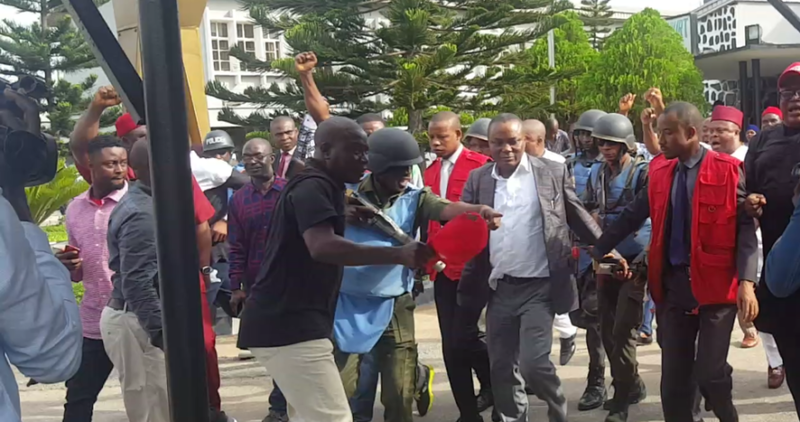 The Nation reports that the EFCC brought Nwaoboshi to court at about 8:49am amidst tight security provided by heavily-armed policemen positioned all over the premises. Hundreds of his kinsmen and loyalists, who arrived hours earlier, swarmed the white Toyota Hiace bus the lawmaker was in, chanting “Agu ne che mba! Agu ne che mba! Agu ne che mba !”, Igbo for “Lion which protects the people” and “Oshomiri”. They obstructed EFCC officials and gun-toting policemen, who ferried Nwaoboshi away from Justice Idris’ courtroom building, to another courtroom behind it. At about 8:54am, the lawmaker was led to Justice Idris’ courtroom where he was docked on two counts of money laundering and fraud, alongside two firms – Golden Touch Construction Project Limited and Suiming Electricals Ltd. In the charge marked, the EFCC alleged that Nwaoboshi and Golden Touch Construction Project Limited purchased a property known as Guinea House, Marine Road, Apapa, Lagos for N805m between May and June 2014. Suiming Electricals Ltd. was accused of aiding Nwaoboshi and Golden Touch Construction Project Limited to commit money laundering on or about May 14, 2014. The prosecution said the offences contravened sections 18(a) and 15(2)(d) of the Money Laundering (Prohibition) Act 2011 and were punishable under Section 15(3) of the same Act. Nwaoboshi’s counsel, Dr. Velerie Azinge (SAN), urged the court to grant Nwaoboshi bail on self-recognisance or liberal terms. Azinge said besides suffering from a heart-related ailment, the senator would not jump bail, as, according to her, he must always attend Senate proceedings, failing which his seat would be declared vacant by the Senate President. “This is a case of a pure commercial transaction,” she added. In the alternative, Azinge suggested that should the court be unwilling to admit Nwaoboshi to bail on self-recognisance, the terms of the bail should be liberal. She said: “Alternatively, in the event that the court is not minded to grant bail on self-recognisance, we will be craving the court’s indulgence to grant bail in the most liberal terms. EFCC counsel, Abubakar Mohammed, opposed the application on the ground among others, that it was not yet ripe for hearing. He noted that the commission was served with the bail motion on April 24. “The prosecution is currently filling its processes at the registry of the court,” Mohammed said. He, however, conceded that the decision to grant the bail was at the judge’s discretion. Replying, Azinge insisted that the prosecution was served with the application on April 23, but refused service. She added that the bailiff of the court attempted service same at the EFCC office but same was refused and the bailiff deposed to an affidavit of service. In response, the prosecutor said he was not aware that service was refused by the commission. The prosecutor said even if service was properly effected, same was still not ripe for hearing as the rules provide for two clear days. He submitted that the prosecution was also ready to proceed with trial, but that the court could stand down the case, if the defence so wished. Justice Idris stood down the case until 11am to hear the applications. When hearing resumed, Justice Idris adjourned till April 27 (Friday), for ruling.